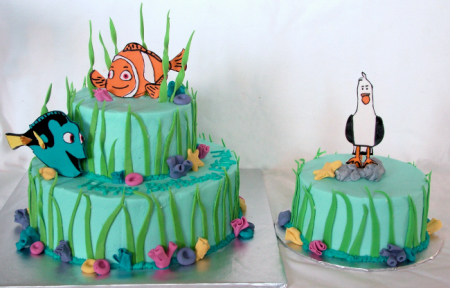 A friend approached me to make her son’s 2nd birthday cake – Nemo themed! So fun! I loved making these cute fondant characters to go on top. I think the “mine” seagull was my favorite character to do. The main cake is a 6″/10″ and the small cake (for the b-day boy) is a 6″ one as well.